I am an independent marine plankton scientist and filmmaker. My research interests lie in how we influence the plankton and the food web it supports through the effects of climate change to plastic pollution. Consequently, my research is of broad ecological and societal relevance. 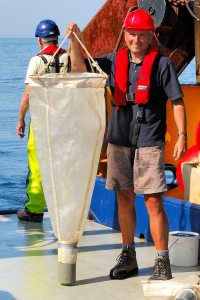 I am also interested in plankton outreach and to that end I have toured plankton exhibitions around the world, worked with international fashion designers, and I created and lead the global, citizen science Secchi Disk study http://www.secchidisk.org. The Secchi Disk study has no end date and is the largest citizen science plankton study in the marine realm with sailors collecting data from every ocean. Research and outreach are of equal importance to me. The plankton is an amazing world of life of striking beauty and, while often overlooked, these remarkable creatures affect every aspect of our lives; they matter to me and to everyone else on planet earth. The plankton begins the marine food chain, it is the food for fish, which in turn are eaten by other sea creatures such as seabirds, sharks, and seals, in their turn eaten by larger predators like killer-whales and polar bears. The plankton is also the food source of some of the largest mammals on Earth, the baleen whales. In this way the plankton food determines the amount of life in the sea. The plankton does much more than just support the marine food web, however. The phytoplankton (microalgae) is also an important influence upon our climate by consuming carbon dioxide. Over hundreds of millions of years, the dead remains of plankton that settled to the sea floor created slowly our oil and gas reserves, thereby sequestering atmospheric carbon in the sediments. Today we use this processed plankton for our transport, the man made materials of the clothes we wear, and to fuel modern agriculture. Their influence doesn’t end there, however. The plankton also shaped the landscape around us. Much of England where I live is made from the calcium carbonate skeletal remains of phytoplankton that lived in Cretaceous seas and this includes the iconic White Cliffs of Dover. We make cement made from these calcium carbonate deposits to hold our homes and cities together.